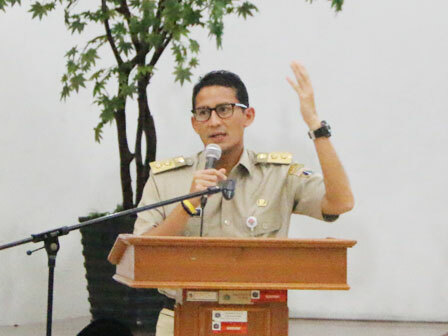 Jakarta Vice Governor, Sandiaga Uno encourages citizen to stop using groundwater.
" We want all residents to remind their neighbors to stop using groundwater"
This act is aimed to prevent land subsidence in Jakarta. "We want all residents to remind their neighbors to stop using groundwater," he stated, Tuesday (3/13). Thus Sandi supports one of Jakarta BUMDs, PAM Jaya that will add more pipe networks in Jakarta. "We will keep support PAM to invest and doing the best of its work in piping to succeed act to stop using groundwater," he a ffirmed.